We all know how hard choosing the perfect gift for everyone can be, so with that in mind I have put together some of my favourite Kids gift ideas this year. Happy shopping! LeapStart is the perfect gift if you are looking for an all-in-one learning system that will help to build kids educational and social skills. The new interactive system brings learning to life, by teaching key educational and life skills to provide your Children with the tools they need to prepare for the bigger world! The LeapStart system works intuitively with a library of 16 activity books (sold separately), covering four learning levels. These books grow with your child, helping to teach 50+ key skills from the alphabet and 123’s to space science, basic coding and educational problem solving. This of course helps them prepare for the future and supports their learning during Nursery, Reception and year 1. Liv received the LeapStart earlier this year and absolutely loves it! She has always loved reading stories to herself, obviously making up the words, but the amount of words she can read in Reception astounds me! The best is she doesn't even know that she is learning - to her she is just having fun! Zwoosh Ball is the amazing floating ball game that is perfect for indoor play. Powerful fans create a cushion of air underneath, turning any surface into an instant playing field! The rebound bumper protects furniture, skirting boards and walls so it is safe to play with inside, plus the clever ‘Disc’ design keeps Zwoosh Ball firmly on the floor. The built in flashing LEDs mean the fun doesn’t even have to stop when the lights go out! Priced at £11.99 from JML. Liv is a typical Girly Girl, loving all this pink and glittery, a mix of the two and she becomes delirious! When she was asked to chose some shoes from The Sparkle Club she was so excited, throw in to the mix that they offer matching bags and she was jumping up and down with excitement! Offering beautiful children's shoes in sizes 8 to older girl's 5, the Sparkle Club (based in Blackburn) design glitter-mad shoes and matching handbags in bold colours - think Dorothy in the Wizard of Oz! Liv has worn hers a few times and I am pleased to say that very minimal glitter has fallen off and I can't see where when I look at the shoes. 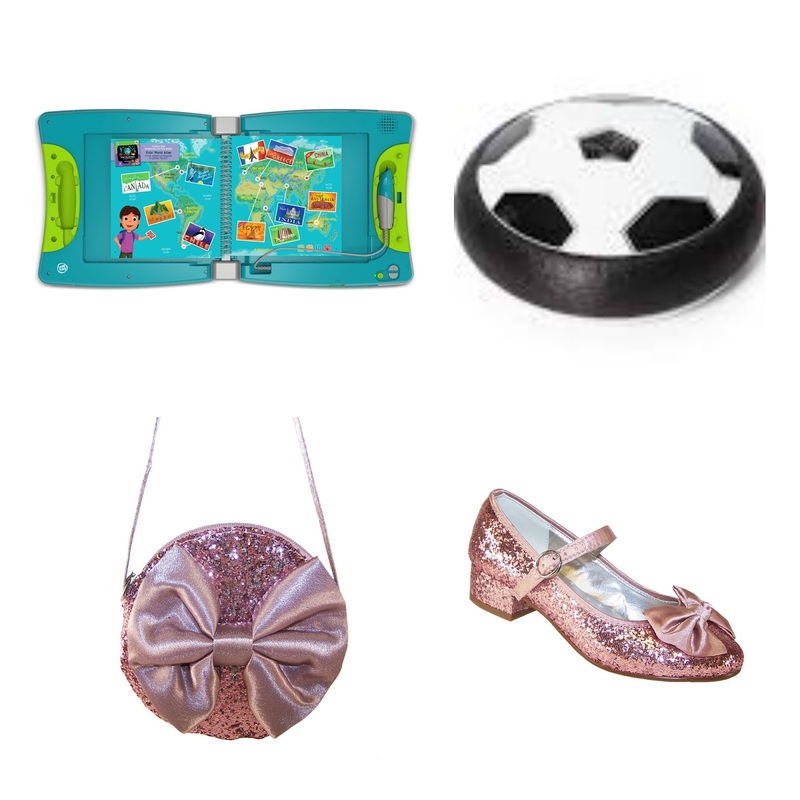 They are fabulous quality and the perfect gift for any little glitter Princess like mine! Prices start from £16.99 for the shoes and £8 for the little bags. This adorable New BABY Born Interactive Girl Doll is just like a real baby! Complete with 9 life-like functions such as controlled wetting and pooping, crying real tears, eyes that open and close as well as arms and legs that move, your little one will feel just like they are looking a real baby! Accessorized with a bodysuit and hat, this doll also comes with a plate, a spoon, a portion of porridge, a bottle, a potty, a nappy, a dummy, a dummy chain, a birth certificate and matching friendship bracelets for your little one and the doll, there is a lot to keep them occupied this Christmas. She is even bath able so your little one can either take her in the bath with them or bath her in the BabyBorn bath. Suitable for ages 3+ no batteries required. These lightweight Discovery Kids Digital Walkie Talkies, have an outdoor range of up to 3km, meaning your little ones can keep exploring whilst keeping in touch - even from one garden to another! With 3 channels, a ringing tone to alert incoming transmissions and LED display, night light, one-on-one outdoor communication has never been more convenient and fun! 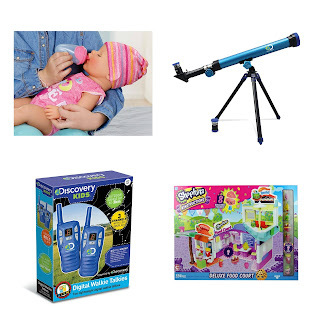 This Discovery Kids 40mm Astronomical Telescope will allow your Children to view the moon, other planets and the stars with it's 25-50 times magnification, two eyepieces (20mm and 10mm) and can be used hands free with the tripod. This fabulous Science toy has real working features that inspire kids to investigate and learn, of course while having lots of fun! 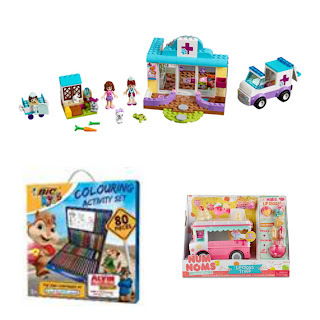 This lovely set comes with more than 300 pieces which are compatible with other similar construction kits. Not only that, it also features eight Shopkins figures that can be pulled apart to mix and match with each other, making their own Shopkins Characters. If that isn't enough, each set also includes one mystery Shopkins figure! With this Vet Clinic Lego Junior set is perfect for age 4 - 7, with slightly larger pieces to fit more comfortably in small hands. Your little ones can help Olivia and Mia’s veterinary team look after the injured and sick animals. They can pick up animals in need in their ambulance, wheel them into the clinic on the examination table where they can be treated. Included in the set is a little rabbit, a baby rabbit, a cat, a turtle and hedgehog who all need looking after. Also included are a huge range of accessories including a stethoscope, otoscope, thermometer, feeding bottles, medicine spoon, clipboard and pen, ice pack, syringe and animal food. This large BIC Kids Colouring Activity Set, includes a whopping 80 pieces across colouring instruments and stencils. It is the ultimate colouring companion for budding young artists this year and is guaranteed to keep them busy this Christmas. The addition of a carry handle makes the box set ideal for taking away on Christmas breaks, so children can colour to their hearts’ content! This Num Noms Lip Gloss Truck playset is something I definitely would have loved as a little Girl! This set is designed to allow your little ones to easily make their own lip gloss. Included in the set is the lip gloss ingredients, mixing accessories, 1 scented Num, 3 lip gloss container Noms, and 1 collector's men. Have fun mixing up your own colours and flavours together and wearing them too! 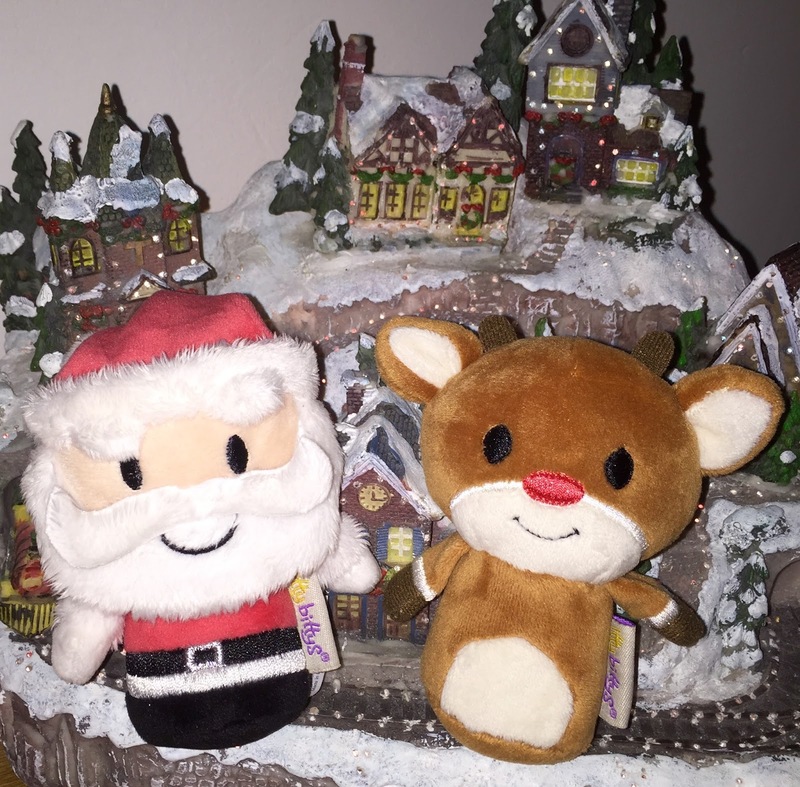 Read with Me Scout & Violet is the perfect gift if you’re looking for a toy to encourage a lifelong love of reading. Scout and Violet are cuddly interactive learning puppies that encourage and engage children by asking questions throughout the story to help build comprehension skills and ensure an exciting reading experience. These playful pups come with five colourfully illustrated books, which help to teach children a variety of educational skills. As Scout and Violet complete each page, they will ask your Child one of over 70 different engaging questions to make sure they were paying attention to the story! A fantastic way of helping them learn without them even knowing it! All-new tablet featuring a 7” hi-res multi-touch screen with sharp, crisp graphics, makes learning fun come to life before your very eyes! With a fast and powerful processor, sleek design and Wi-Fi with Kid-Web, this tablet helps to keep your kids safe in several ways, like protected web browser serving up a ton of kid-appropriate videos and more. Children can also access 800+ games (sold separately) all of which are designed or approved by LeapFrog educators with select titles featuring Just For Me Learning. Suitable for ages 3-9 yrs. 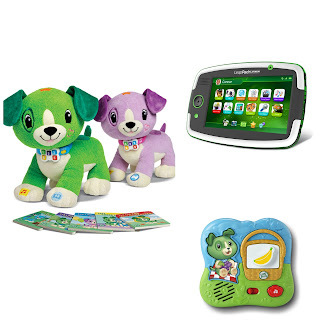 This LeapFrog magnetic fridge number set is yet another clever learning tool from Leapfrog. The aim of the game is to help Scout pack his picnic up by playing matching games and sing-along fun. Explore numbers with the 20 interactive, colourful tiles that talk, sing and teach. Plenty of fun to be had! Dentek have designed these cute little toothbrush covers to help make brushing more appealing and keep the head of your Childrens toothbrush covered. Available in several fun designs including a dog, lion or penguin, the covers allow for ventilation helping keep dirt and germs at bay both on the go and in the bathroom. Priced at £3.99 instore at Boots. Liv is absolutely obsessed with "lipsticks" and has asked for her own make up this year. Obviously at 5 years old I don't want her with a face full of make up so this Jelly Bean Merry Kissmas gift set is the perfect compromise. The 6 piece collection- consisting of six flavoured lip balms- Berry Blue, Tangerine, Tutti-Frutti, Very Cherry, Strawberry Jam & Wild Blackberry will be a firm favourite of hers this year! 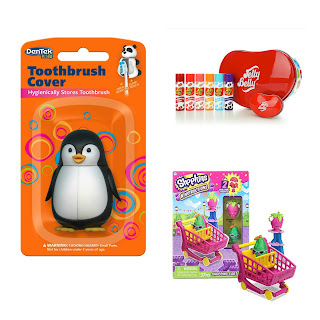 This little Kinnect mini pack includes a shopping trolley and two Shopkins figures. Each set comes with two different characters inside including Strawberry Kiss & Posh Pear, D'Lish Donut & Soda Pops, Freezy Peasy & Wild Carrot or Lippy Lips & Polly Polish. The perfect size and price for a stocking filler, these will definitely be a favourite in our house! These adorable little Santa and Rudolph teddies are just adorable and at just under 5 inches tall, they are the perfect size for little stocking fillers. They are lovely and soft with a little beanie bottom to help them stand up. Great for little ones too as they have cotton stitched eyes so no small parts for them to pull off. Not only for Christmas, these little delights are also available in a huge range of Disney, Star wars, Wizard of Oz and many other characters! I feel a collection coming on!